Ege Seramik’s state-of-the-art technology brings its new INDIANA Series to life with realistic colors and “relief” textures. “We use a ‘deep ink’ (sinking ink) application on this exquisite product line,” stated Alp Er, General Manager of Ege Seramik USA. “Upon first glance, we have a natural marble design, but up close, the veining is actually collapsed in the tile… below the surface. Bascially what happens is that the design is etched right into each piece of tile via the ink application process. Available in beige and grey, the INDIANA Series is extremely effectively creates a dramatic and realistic natural stone installation. The Series comes in 12×24”, 24×24” and 24×48 format… fully polished. The INDIANA Series offers the beauty and texture of natural stone in a durable, stain-resistant porcelain tile… a combination being embraced by designers, demanded by end-users, for every day usage in both residential and commercial environments. 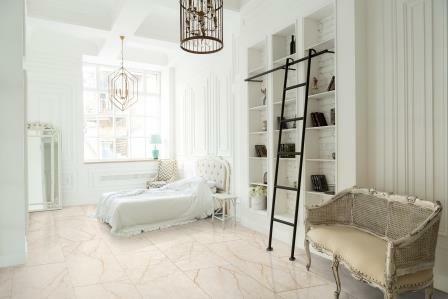 Attendees of the largest tile and stone exhibition in North America, COVERINGS 2019, will be able to see all of Ege Seramik’s Collections, April 9-12, 2019 at the Orange County Convention Center, Orlando, FL, Booth #3061. To learn more about Ege Seramik and view the entire product line, visit egeseramik.com or contact the firm directly at Ege Seramik America, Inc.: 1721 Oakbrook Drive, Suite C Norcross, GA 30093; (678) 291-0888.